ACC Co-organized Roundtable of "New Rural E-Commerce in China"
On 19 January 2017, ASEAN-China Centre (ACC) and Alibaba Group co-organized the roundtable of “New Rural E-commerce in China” in Beijing. About 20 diplomats from the Embassies of ASEAN Member States in Beijing participated in the activity. Mr. Mouavixay Palee, Deputy Director of Trade and Investment Division, delivered a speech on behalf of ACC. He said that promoting ASEAN-China cooperation in trade and investment is one of ACC’s priorities. 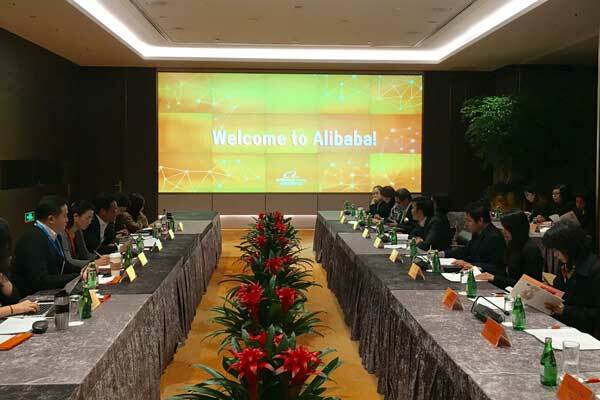 In recent years, ACC has made a series of efforts on e-commerce cooperation between the two sides, including organizing a trip for commercial counsellors from ASEAN countries in China to the headquarters of Alibaba Group in Hangzhou, Zhejiang Province, which proved to be a good practice. This year marks the 50th Anniversary of ASEAN and the Year of ASEAN-China Tourism Cooperation. The cooperation between ASEAN and China is reaching new opportunities. ACC, by co-organizing today’s roundtable, hoped to play a better role as a “one-stop” information and activities centre and make new contribution to enhancing ASEAN-China e-commerce cooperation. Mr. Brian A.Wong, Vice President of Alibaba Group, thanked ACC’s full support He said that Alibaba has maintained good cooperation with ASEAN countries. With the fast growing of Tmall, Cainiao Networks, and Ant Financial in ASEAN in recent years, e-commerce cooperation between the two sides has entered into a new stage. “Rural Strategy” is a crucial development strategy of Alibaba since it became a listed company in 2014. “Rural Taobao” initiative, as one of the core business of Strategy, has covered 485 counties and 25,000 villages across 29 provinces, and built up an e-commerce service platform in China’s rural area. He wished that Alibaba and ACC would make jointly efforts to strengthen the cooperation with ASEAN countries. ASEAN diplomats listened to the introduction on rural e-commerce, finance and logistics development by specialists from Rural Taobao, Ant Financial and Cainiao Networks, and made an active interaction with Alibaba on patterns of Rural Taobao, staff recruitment and training, selling rural products to urban areas, and construction of rural logistics. They all believed that this activity helped ASEAN countries learn more about Alibaba’s “Rural Strategy” and the development of rural e-commerce in China. The two sides should further strengthen communication and jointly explore the potential for future collaboration.